The one thing that I can say about this novel, unconditionally, is that it is a gripping novel. Yes, the pacing dips at times, and at times the characters just act weird, and what not, but the story still maintains your interest. It did for me. I just wanted to keep on going and going and not stop reading the book. In that respect, it is very much like its predecessor. Given that the characters all deal with the fallout of the events from the previous novel, and the fact that several new characters are introduced this time, there isn’t a moment in the novel where you actually want to just give up on it, at least for a while. One of my complaints with big fantasy novels is that at times they fell too bloated and it is easy to lose any interest in the reading of it. While Straits of Galahesh does feel bloated in a few rare cases, the central story is packed with enough mysteries and reveals to keep you going. Given the world-ending themes and plots that were introduced in the previous book, we continue to see here how those revelations have changed Anuskaya now, some years removed from those fateful events. It makes for a really interesting reading experience since Bradley pretty much notches up the tension and scope of things by several degrees. As the book starts, the various Dukes have to contend with a neighbouring nation that wants to either ally with them for its own benefit, or make war on them for that reason. This in turn leads to a strained relationship between the two protagonists, Nikandr and Atiana, who were to be married in the previous novel but their relations were ultimately called off because of some momentous reversals suffered by Nikandr and House Khalakovo. Now, with this new threat on the horizon, Tatiana is given the option of marrying the errant neighbour king, and it is something that she constantly rails against. So the really fun part of the novel is in seeing how Nikandr and Tatiana rekindle their romance and where they go from there. Some of the scenes involving both Nikandr and Atiana seemed rather superfluous in the novel, and I think could have been better if they had been just cut. They were all basically resets of a status quo because of certain plot twists that seemed rather random. This happened especially with Nikandr in the second half of the novel, towards the end when the story is just about to get into the climax. These were weird moments at best and made me wonder if they had been added in for the sake of adding plot twists rather than anything genuine. Other than some more minor quibbles on characters, that very element still remains one of the strongest elements of Bradley’s writing, in addition to his thorough and complex world-building. We see a whole lot more of the various magic systems that are used in Anuskaya and each of them has its own charm and what not, which I loved. Incredible diversity here. Even the action scenes were a step up from those in the previous novel. They were much more detailed and better choreographed, all of which went towards making for a better reading experience. The ship battles in particular were thrilling affairs. 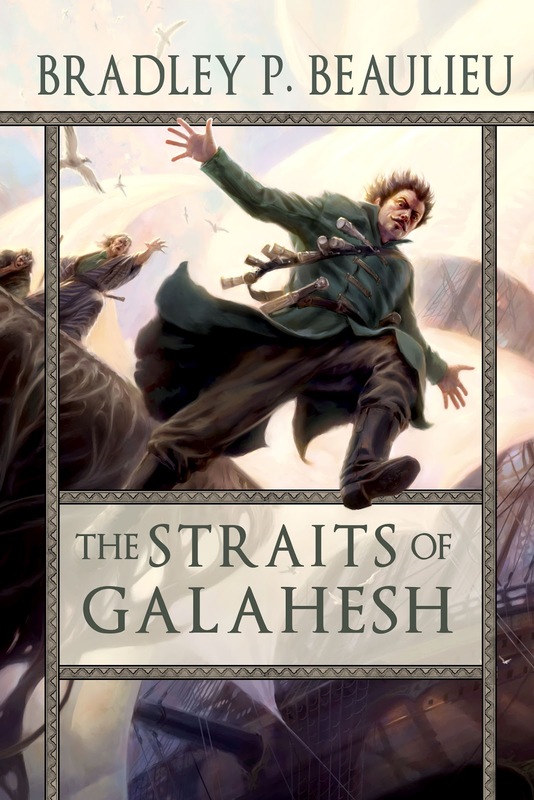 Overall, there are some unwelcome drops in quality for this series with Straits of Galahesh but at the same time, it was still a far better read than some that I’ve read in the last two years. And I’d recommend it. It needs the context of the first novel to be appreciated fully, and that was helpful for me in retrospect since I did have the experience from the first novel. Onwards and forwards, I should be reading the third and final book in the series quite soon. More Bradley P. Beaulieu: The Winds of Khalakovo. Posted on December 18, 2013, in Book Reviews, Review Central and tagged 2013 Reading Challenge, Aramahn, Atiana Vostroma, Book Review, Book Reviews, Bradley P. Beaulieu, Challenges, Epic Fantasy, Fantasy, Female Protagonists, Female Warriors, High Fantasy, Lays of Anuskaya, Maharrat, Night Shade Books, Nikandr Khalakovo, Non-Anglophone Fantasy, Non-Western Fantasy, Rebellion, Rehada, Review, Review Central, Russian Fantasy, The Straits of Galahesh, The Winds of Khalakovo, Warrior Women, Women in Fantasy, Women in SFF. Bookmark the permalink. 3 Comments.